once upon a time, a happy gentle ragdoll lived in a peaceful pinata town. She loved to help others and repairs things thanks to her amazing stitching and sewing skills. Unfortunatly, the town's children were horrible with her and constantly tore her apart, forcing her to stitch herself up all the time. One day, a terrible accident occured, and she was chased out of the village. Ever since, a strange little girl, with a thick mexican accent, can be observed wandering the shadiest parts of town, merrily helping people, improving them, stuffing back the sticky pink smelling filling inside the dead bodies. 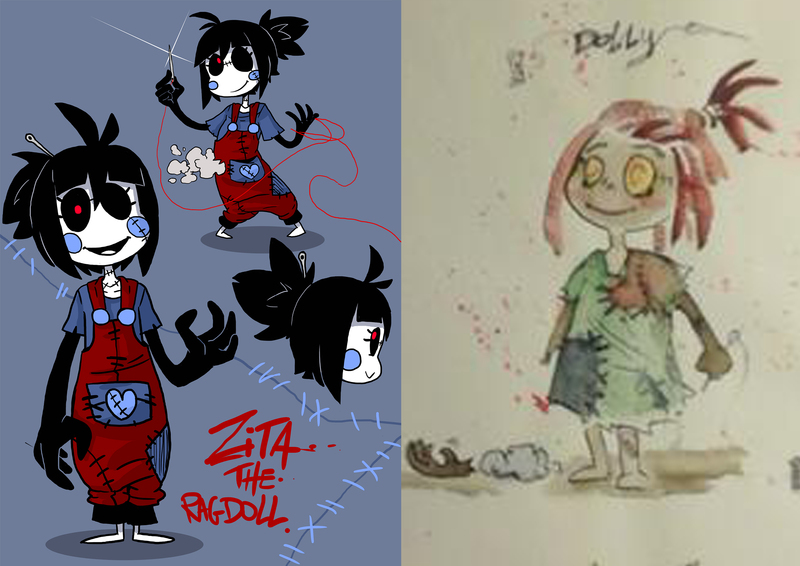 Zita is a living ragdoll that can repair itself and bleed cotton. If damaged, she will scavenge materials to repair herself, and those materials will slowly change themselves into cotton and fabric. Zita can stitch, sew, and bind everything she can get her hands on. there is almost no boundaries to this power. the red thread she use can only be cut by her and her alone. Her arms are made of a strange black fabric that seems to stretch to impossible lenghts and are near indestructible, and very strongs to boot. Most disturbing fact about her is that she project some kind of eldritch field that slowly warp people's perception of her until they only see her as a cute harmless young girl, and will not even feel pain when she stitch them up. This field can be countered if you have prior knowneldge of her and her powers. Zita is a happy being that has an obssession about repairing things. Be it a teddy bear with a tear, a broken relationship or simply helping people in general, and usually i harmful ways. Zita seems incabable to willingly hurt people and inflicts pain on others, but never realize that her helping people often results in their demise more than their happyness. Zita likes befriending people, is receptive to what people say to her, but see living people around her as dolls. she absolutly doesn't understand the concept of death. Naive, scatterbrained, easily lose her focus if distracted, and can be taken apart, even if she can repairs herself afterward. Fire seems to works wonders, while dampening her slow her down. She also want to learn things to better help people, and will try to copy what people do, but will often result in disaster.